The St Bernard is instantly recognisable by most people as a noble giant struggling through blizzards to rescue stranded, frostbitten travellers, reviving them with brandy kept in a cask fastened around his neck. The image of a rescue mission is true, although the St Bernard never had a cask of brandy around his neck; that was purely fictitious. A gentle giant, the St Bernard is a loyal companion who gets on well with people and other animals, responding well to training and a family orientated background. The national dog of Switzerland, which is where the breed originated, the St Bernard was recognised by the United Kingdom Kennel Club in the late 1800s with the first St Bernard Club being formed in 1882, followed by the formation of several others. This eventually culminated in the English St Bernard club, formed in 1922, the parent club for the breed. Average litter size: Between 5 and 10, although can be more. Life expectancy: Between 8 and 11 years, although sometimes they can live to 13 or 14 years of age. St Bernards are typically white with tan, orange and red-brindle patches on the body, which can vary in intensity. The muzzle, chest and legs, along with a blaze down the centre of the face are white. 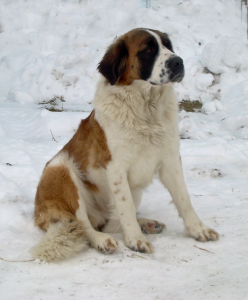 Black markings will also appear on the head and face, giving the St Bernard its well recognised appearance. There are two types of coat: rough haired and smooth. Both types of coat will benefit from daily brushing with a short toothed slicker brush, as well as a wide toothed comb to keep moulting to a minimum. You should also remove any knots or tangles. Care should be taken to keep the eyes and ears clean, as well as good dental care. St Bernards are extremely strong, robust dogs who usually enjoy good health. Hip and elbow dysphasia can be hereditary in the breed so it is essential that the parents have undergone the necessary tests to avoid any problems. Hereditary heart and epilepsy conditions can also occur but again, the correct testing should avoid potential health problems in your puppy. 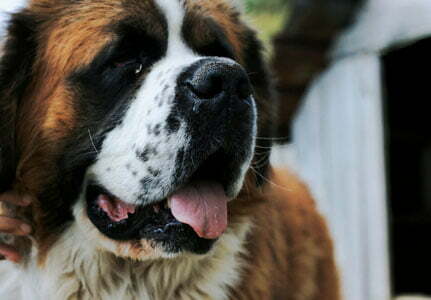 Like many larger breeds the St Bernard can be prone to stomach bloat but correct feeding times, which do not immediately follow or precede exercise periods, as well as advice from your vet will keep your St Bernard healthy. A St Bernard really is a gentle giant, very happy to play with children and other dogs as well as loving family life. A St Bernard will easily adapt to new additions to the home as well as adapting well to surroundings. It is advisable to train and socialise your St Bernard from a young age so that he will respond to your commands and be well behaved around others. A St Bernard tends to respond well to gentle training methods and is eager to please. As with all large breeds, training to walk well on the lead is essential as they are extremely strong, so control is necessary. A St Bernard isn’t fully grown until 12 to 18 months of age so care should be taken not to over exercise whilst their bones, which are soft and easy to damage, are still growing. As puppies and young dogs they require short walks each day but when they reach twelve months they will require a little more exercise, building to a total of about 60 to 90 minutes each day, split into two walks. Longer walks will be appreciated as the St Bernard will adapt to most conditions within reason. 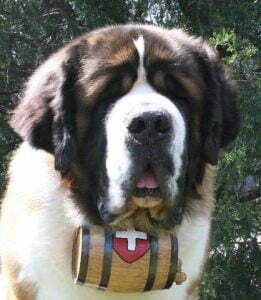 The St Bernard originated in Switzerland between 1660 and 1670, when monks bred dogs descended from mastiff type dogs used by the Romans and monks as guard dogs. 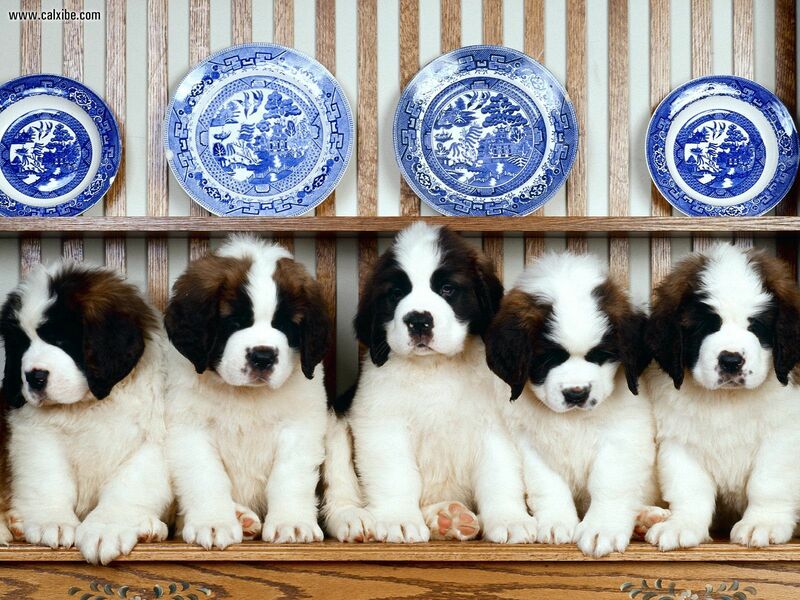 These early St Bernards were much smaller than the breed today, although with the same colouring. In the early 1800s the breed came close to extinction after particularly bad storms and avalanches one winter killed many of the dogs, almost wiping the breed out. The breed was saved by cross breeding with similar dogs in nearby valleys. At this time the breed was without a name, although many called them Alpine Mastiffs or St Bernard Mastiffs. They were eventually named after the St Bernard pass after a famous St Bernard, called Barry, saved the lives of 40 people lost in snow on the treacherous pass. On his 41st mission, Barry was killed by a traveller. The dog’s body was preserved and is still displayed at the Natural History museum in Berne, Switzerland. Interestingly, the image of a St. Bernard with a cask of brandy tied around his neck rescuing stranded travellers was created by artists who portrayed the St Bernard this way. However, it is true that the St Bernard was used as a search and rescue dog with a search team until fairly recently, although it is now more usual to employ the services of a helicopter. There are many well known St Bernards who have appeared in films and on television. 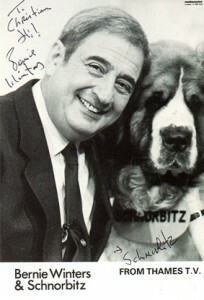 One that many will remember fondly is Schnorbitz, who appeared with comedian Bernie Winters on stage. A well known book by Stephen king, which was later made into a film, introduced Cujo who portrayed a lovely St Bernard who contracts rabies and turns into a beast that terrorises a small American town. Another movie star St Bernard played the part of Beethoven in 1992 in the movie, and its sequels. US football team the New Orleans Saints have a mascot called Gumbo, a well known St Bernard.